Triple Output Laboratory Power Supply POWERLAB 3010D-II 2x30V/10A, 5V/3A DC LED is adjustable regulated power supply has two adjustable channels and a 5V/3A regulated output channel. 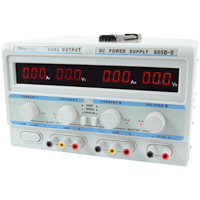 This DC power supply has high stability, high reliability and low noise when it automatically converts between Constant Voltage and Constant Current. It can be used in many different areas, from the testing equipment in reaserch and develop on the power in laboratories of universities and collages. Triple Output Laboratory Power Supply POWERLAB 305D-II 2x30V/5A, 5V/3A DC LED is adjustable regulated power supply has two adjustable channels and a 5V/3A regulated output channel. This DC power supply has high stability, high reliability and low noise when it automatically converts between Constant Voltage and Constant Current. It can be used in many different areas, from the testing equipment in reaserch and develop on the power in laboratories of universities and collages. 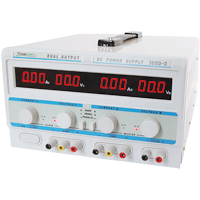 Laboratory Power Supply PowerLab 305D2A AC/DC is linear Adjustable Power Supply AC/DC series - 30V/2A AC; 30V/5A DC is a equipment with high stability, high reliability, low noise, its output voltage or current can be continuously adjusted, and its constant voltage and current can auto-conversion. This low cost and universal power supply can be used in many different areas, from test of R&D equipment to test of production lines. Proffesional power supply Matrix it's power supply that gives 2x(0-30V 5A) + 1x(5V 3A). It's fully professional equipment that gives power to any gsm phones or other electric parts ! From now one you will not have any problem with any GSM phone power. 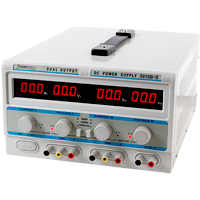 Triple Output Laboratory Power Supply POWERLAB 303D-II 2x30V/3A, 5V/3A DC LED is adjustable regulated power supply has two adjustable channels and a 5V/3A regulated output channel. This DC power supply has high stability, high reliability and low noise when it automatically converts between Constant Voltage and Constant Current. It can be used in many different areas, from the testing equipment in reaserch and develop on the power in laboratories of universities and collages. Triple Output Laboratory Power Supply POWERLAB 605D-II 2x60V/5A, 5V/3A DC LED is adjustable regulated power supply has two adjustable channels and a 5V/3A regulated output channel. 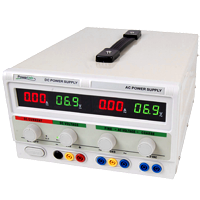 This DC power supply has high stability, high reliability and low noise when it automatically converts between Constant Voltage and Constant Current. It can be used in many different areas, from the testing equipment in reaserch and develop on the power in laboratories of universities and collages. 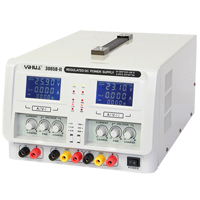 YIHUA 3005D-II Dual adjustable DC power supply is a dual-channel DC power supply with continuously-adjustable current and voltage, a large-screen LED-backlit display, and built-in knobs to help operators eliminate hidden dangers resulting from faulty adjustment. Channel II independent operations feature automatic tracking in series or in parallel. The third fixed output features selection between 2.5V, 3.3V, and 5V. Stunning in appearance and outstanding in performance, the machine is suitable for technology product development and use in laboratories, teaching, and electronics production lines as well as in essential communications industry equipment.